This recipe for Green Smoothie Pancakes has all the healthy ingredients from your favorite smoothie in pancake form so you can prep them ahead of time and reheating for breakfast during the week! It’s time for another month of Recipe Redux! This month the theme was breakfast – my favorite meal of the day! While I’m fairly happy eating the same thing for breakfast every day, I’m doing my best to expose Squish to a variety of new foods so I’m always looking for new breakfast ideas for him. I like simple recipes that are packed with nutritious ingredients and I especially like breakfasts that can be prepped ahead of time so I can get breakfast ready quickly in the morning. These Green Smoothie Pancakes fit the bill. We’ve been enjoying them for breakfast AND lunch. I actually like them even better the second day and even sometimes prefer them cold, straight out of the fridge! Squish likes them smothered with peanut butter. Add first 8 ingredients to a blender and blend until well combined. Cook pancakes in a skillet or griddle over medium heat. Serve topped with more peanut butter, yogurt or syrup! 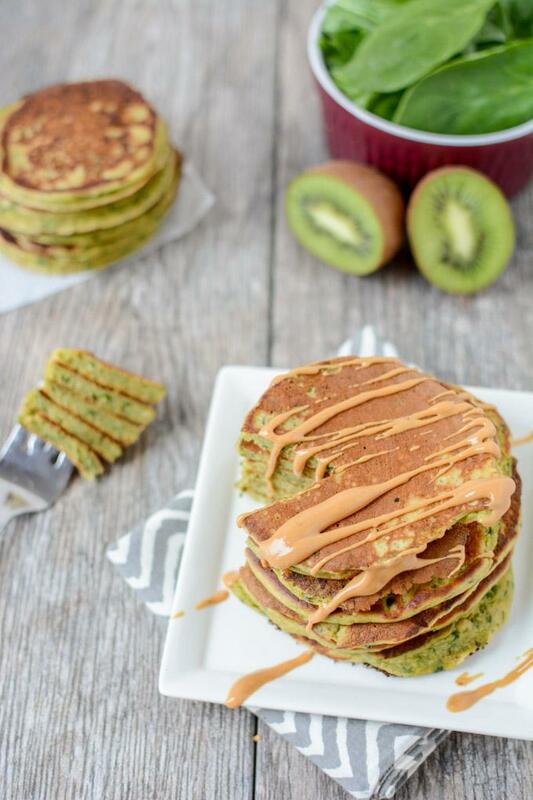 These pancakes are packed with healthy green ingredients like spinach and kiwis, plus hemp hearts, nut butter and greek yogurt for added protein and healthy fats! We’ve been loving smoothies as a snack lately, but I just can never seem to get into them for breakfast. I think I just like chewing my breakfast. Green Smoothie Pancakes are the perfect compromise! All the delicious smoothie ingredients in a form you can eat with a fork! Plus the green color makes them fun to eat and all the flavors covering the spinach makes them kid-friendly! One thing I did notice is that if you eat them hot straight out of the pan, you can taste the spinach a little more than when you let them cool down a bit or eat them cold! 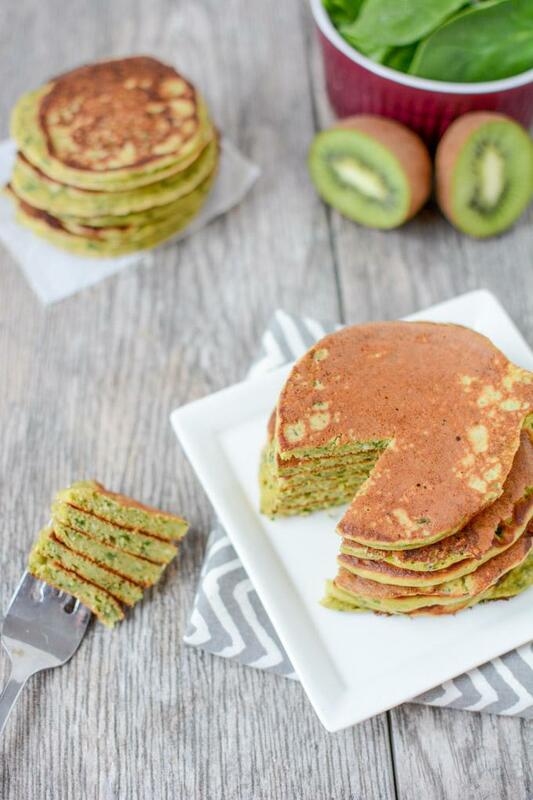 Make these Green Smoothie Pancakes from @leangrnbeanblog to enjoy for breakfast all week! These look great and would be perfect for St. Patty’s day too! I love this! I recently saw green waffles and I was mesmerized by them. This must be a sign that I need to make them! This is a great idea Lindsay! I’m definitely trying this! i love that i get a sneak peak of your meals on snap chat. YEA kiwi! and yay gREEN! I am with you, I am usually not big on smoothies for breakfast, but this is such a fun twist! I know my kiddos would love the green color too. Thanks for sharing! I have been making green smoothie pancakes for my kids for years. I usually will make a huge batch to keep in the freezer for snacks or busy week day mornings. I’ve been known to make them for dinner too. Because what’s good for breakfast is good for dinner! Kiwi pancakes I would have never thought to put kiwis in pancakes! Most things I make for breakfast all week egg muffins, pancakes, etc end up being eaten cold straight out of the fridge! Lindsay, this is genius!! I am so excited to try this! So smart to add greens to your pancakes! I’ll have to give them a try–my daughter LOVES pancakes and peanut butter too! YES!! Great moms, ummm I mean minds think alike!! I totally just had a cinnamon and spinach flapjack recipe on my site a few weeks ago. I need to try this version too! Looks awesome! I have to try this recipe asap! There is not single thing that I don’t like about it. I made green crepes before, by adding some leafy greens in it, but all the smoothie shebang in a pancake is just brilliant! 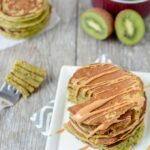 Spinach AND kiwi in pancakes! How creative! I must try these. These are genius!! Love how you snuck in all the nutrition of a green smoothie…in PANCAKES. I am all for simple and satisfying. What a cool idea!!! Now I want to make some fruit pancakes! This is genius. I would never think to combine those ingredients! haha I was thinking about making something like this for breakfast this morning! What a deliciously clever idea 🙂 Love it! Okay not only is this aesthetically pleasing, but it sounds delicious AND it is healthy! Lindsay, you are a genius. These look amazing! Will definitely try! These look delicious. Look forward to tasting kiwi in a pancake.